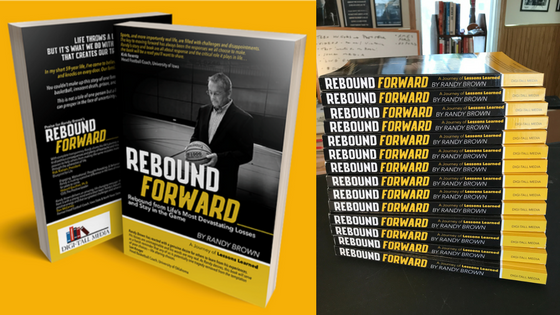 In his new book, coach Randy Brown shares the personal story on how he overcome adversity to win off the court. A lifetime goal of mine was to write a book. Today, I’ happy to say I’ve accomplished this goal and it feels awesome! For those who don’t know me, I spent 20 years as a Division I head and assistant coach at Arizona, Iowa State, Stetson, Marquette, Miami of Ohio, Drake, and North Dakota. I’m a native of Fort Dodge, Iowa and currently reside in Ames where I enjoy working with hundreds of coaches around the country through the Randy Brown Coaching Academy to help them reach their full potential, both as a coach and as a person. Since stepping away from the sidelines, my time is now dedicated to mentoring, writing, and my career as a professional speaker. Sharing my book with literally thousands of people makes me realize how truly blessed I’ve been. 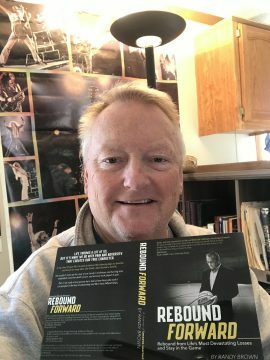 Rebound Forward; How to Rebound from Life’s Most Devastating Losses and Stay in the Game symbolizes the harsh reality that life presents. Once knocked down, the hardest part is figuring out how to get back up! This is a transparent look at my life of failures, poor decisions, family tragedy, along with success that came with raising our family and a pressure-packed college basketball coaching career. Was it difficult to to put some of these feelings on paper and open myself up to readers? Of course. Before writing, I had to make sure my motivations were in the right place. It wasn’t about making money or gaining notoriety – for me, the purpose of this book is about giving others a chance to improve their lives. I decided to “turn my mess into a message.” My story that once was private, is public now. I stand by my poor choices and devastating losses just as I do my success as a coach. Nobody in this world has escaped adversity, and our response to it will change our life! My number one goal is for this book to “reach and touch” those who come across it. If you don’t purchase this book for yourself, gift it to someone who will benefit from it such as friends, family and coworkers. The message will drastically change lives for the better! Thanks for allowing me to share my story with you. “Coach, I just got done reading your book for the second time in 24 hours. All I can say is WOW! I read a lot of books but I just couldn’t lay your down. I found it riveting!! I saw so much of me in the book. Every young coach should read this book. Love you man and I am glad to call you a friend!!! Thanks for sharing.” – Jim Schreffler, Lakeville, MN.